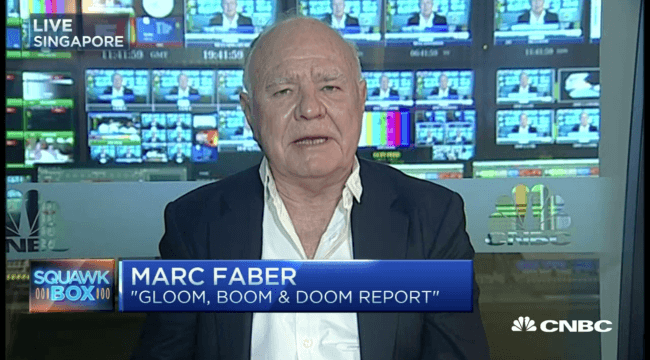 Dr. Marc Faber is the editor of The Gloom, Boom and Doom Report. Dr. Faber has been headquartered in Hong Kong for nearly 20 years, during which time he has specialized in Asian markets and advised major clients seeking down-and-out bargains with deep hidden value–unknown to the average investing public–bargains with immense upside potential. A book on Dr Faber, “Riding the Millennial Storm”, by Nury Vittachi, was published in 1998. A regular speaker at various investment seminars, Dr Faber is well known for his “contrarian” investment approach.